Hello, I'm Terry, new to this forum, 50y young recreational rider. Hey, all. My name's Mike and I live near Milwaukee, WI. I'm 50 years old, but got the biking bug around the age of 18, when a friend and I did about 325 miles over the course of a week. I rode a steely. The brand was Mirafiore, very Italian sounding, but fake, which I acquired when I was 14 for free because it was included as a promo with a stereo I purchased. The following year, I built a 10-speed from a Peugot frame and did a century on it. As you can see, I have a history of proving you can tour on anything. After decades of building a family and growing old, a co-worker got me back into cycling. That was about three years ago. So glad to be back in the saddle. My primary ride is a 2015 Trek FX 7.3 in high-vis green. 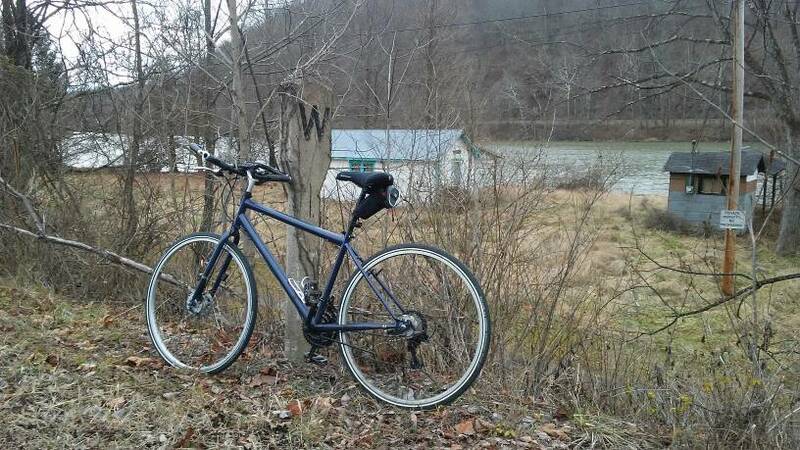 I also have a Pure Fix Papa for fun and a cheapo Schwinn MTB that I've taken on the trails once. After being a marketer for the past 25-ish years, I decided it's time to "switch gears" (sorry) and start a new biz. Of course, it's in cycling. Stay tuned. I hope to become an avid reader on this site, and promise to share once in a while, too. My name is Michael. Three years ago I got into mtb and shortly after that got into racing. After moving up to cat2 I've been stuck mid pack. A few weeks back I decided to do something about it. I picked up a 2005 allez elite from a friend to get some more intense road training in. My hope is to make the jump from 10-15th place to some solid top 5 or podium finishes next season. I'm indianajo, real name too hard to pronounce so don't bother. I'm retired. I've been riding bikes since 1956. Training wheels off 1957. I ride to do all my errands meetings and recreation. I haven't started my car in four years. I can get to the Louisville symphony and park out front of KY center. I can ride to my country summer camp where the only noise is birds, frogs, and diesel pickups without a muffler. I ride about 25 miles a week in winter and about 70 miles a week in summer when I ride out to the summer camp. My bike is set up for comfort, not speed. I liked the old cruisers of the forties, but I cant get up the hills here without at least 15 gears. I've been searching for more gears since I bought a bendix back-pedal two speed coaster/shifter in 1963. Now I have 21. I ride knobby tires on the road to cut the number of flat repairs. Three tubes a year on smooth tires, zero on the kenda knobbies. It's a long walk to the nearest tube for sale from the camp, about 20 miles, so I carry tubes tools and an air pump. Phone service out there is $70 a month Verizon only, so I expect no support in case of trouble. 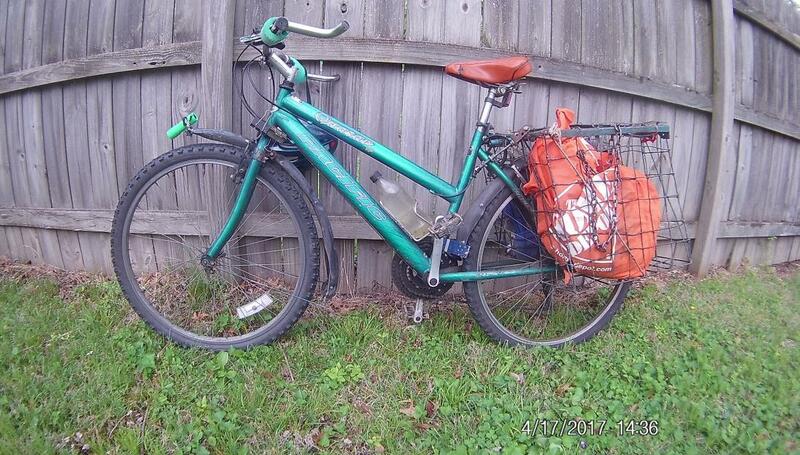 You'll notice black fenders built of yard signs and inner tubes. I ride all weather except when ice is piled in the bike lane. You'll notice a basket made of yard signs and bed frame rails. It will hold 6 gallons of hawaiian punch jugs, or water in the recycled bottles, or a couple of gallons and a week of food & lawnmower parts. I've carried a new AC on it, I've carried empty trash cans, I've carried a spare bike from the resale shop without wheels on it. Muy groceries ride home on the bike, if no ice. If I need to move a piano I rent a truck. I have 28" inseam so a kid mountain bike frame fits me fine. I'd like a taller headstock and real cruiser handlebars to sit more vertically. The weight on my hands is starting to bother my wrist joint and my hands go to sleep after 10 miles. With this drag, I average about 10-11 mph so I don't ride with clubs. They don't stop for traffic signals anyway. I do. The difference between a real 1946 Firestone cruiser (my Mother's) and this style bike, a mountain bike has thrown me over the handlebars on my chin 3 time in 4 years. I'm not fragile, but I don't enjoy it much. Mountain bike steering is too twitchy, apt to rotate to the side on a big bump and throw me. Mother's FIrestone would go straight with no hands. Discussions with frame builders about more caster in the fork have no led to no clues. These tires are 1/4" smaller than hers. But I need the gears in Indiana, or walk up the hills. I can get over 35 down them, if the wind is the right way. Last edited by indianajo; 04-18-2017 at 11:27 AM. Hello. I'm a film-maker and 3D animator who cycles a great deal. I live in Tuscany and the terrain here is magnificent. I also cycle in Palestine twice a year where I teach and run Bike Palestine. Hey guys. Commuter and passion cyclist here from Akron, oh. 28 year old graphic design student working at a bar. Looking into getting into local races or group rides. Specialized Allez epic carbon bike (94) w. Shimano components matrix rims and serfas survivor tires. Let’s ride! Who am I, freshly retired USAF member that commuted once a week. Tries to ride 250 miles a month. Also ride MTB, run street and trails. Active member or Team RWB and active in running groups. For some crazy reason, I also started racing BMX now too. If you don't follow the liberal flock, you are called a troll.